When you think of a Charity shop: you think clothes – shoes – bags right? 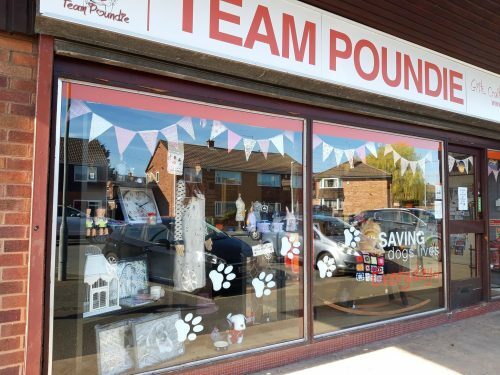 Well Team Poundie’s flagship store is going to be gifts,crafts, dog items, teddies, soaps, bric a brac, candles……pre loved and new. The opening date has been set for the 20th April and will include a Tombola, dog photography (where you will be entered into a competition) and entertainment. We humbly welcome donations of any of the above, including small pieces of furnitue that we can maybe upcycle. The first shop is in Wellington, Telford and we hope you can pay us a visit. Items will also be used to sell in our facebook auctions, so nothing will go to waste. Every penny goes towards saving another dog who has fallen on hard times. Thank you to North Derbyshire Animal Support, the fantastic lady who has got all our racking and a till, the gentleman who raised our deposit and all the other fantastic donations of beautiful gifts, items to make things and wow the fantastic handmade items from Lesley. Thank you to Spryce for designing our sign and window art and to her wonderful dad Richard for allowing us to park all our “stuff” on his premises while we were waiting for the keys. So many wonderful people helping us to save the dogs out there and help people too who really are struggling with their lives. And……thankfully Mandy can now move around in her home. It was full to the rafters! Bless you all – let’s save those lives and end the suffering of so many ! !